Buttress Adapters for plastic drums are available to thread a Morse drum pump to the opening on your plastic drum. See Buttress Thread Adapters in chart below. Double-action piston 55 gallon manual drum / barrel pumps are self priming, delivering on both the forward and the back stroke. It takes less than 5 cycles to yield a gallon (3.8 liters). Each Morse 55-gallon (210 liter barrel) hand drum pump is made in the same style and has the same action. They vary only in their materials of construction, consisting of specific polymers and elastomers for resistance to certain types of chemicals (please refer to the drum pump chart below). Morse manual drum and barrel pumps provide a controlled discharge rate of approximately 1 quart (.95 liter) on complete forward and backward cycle at 10 psi over 24 feet (7.3 m). They fit the NPT (National Pipe Thread) of the 2" (5 cm) bung on 55 or 30 gallon (208 or 114 liter) steel drum. 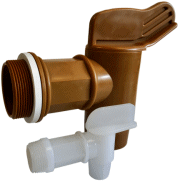 Adaptors are also available to use Morse 55-gallon (210 liter) barrel pumps with the buttress thread of the 2" (5 cm) bung on your plastic barrels. Mount handle above the drum hand pump. Handle will then extend 20.5" (52 cm) above the bung when upright. Mount handle below the drum hand pump for easier operation from below with the drum on a truck or platform. 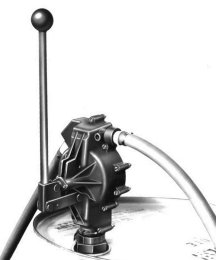 Hand drum pumps are capable of dispensing liquids with viscosity up to 2,000 SSU (about as thick as 30 weight motor oil at room temperature). Handle effort increases as viscosity approaches this maximum. Models 26, 271-AE and 27-4AV drum / barrel pumps are generally useful with compatible liquids in a mild acidity/alkalinity range of pH 4 to 9. Avoid stronger acids and caustics. Models 28-5BV and 28-6BE drum / barrel pumps are useful in a wider pH range. Chemicals may be hazardous. It is the user's responsibility to take appropriate safety and protective measures. Always wear protective safety clothing such as gloves, apron, goggles. IMPORTANT - When pumping flammable or combustible liquids from one container to another, both containers must be effectively bonded and grounded to prevent discharge of sparks or static electricity which could cause explosion and bodily harm. (4.5 kg) L21" W9" H9"
(5.5 kg) L19" W19" H9"
28-5BV ryton viton viton cross linked polyeth. teflon some chlorinated solvents, acids, aromatics, xylene* 12 Lb. (5 kg) L21" W9" H9"
* NOTE: General guide only. Final determination of suitability of barrel pump for intended use, or for manner of use, is responsibility of the user. Consult Morse for advice on drum pump for compatibility with a specific liquid if it is not shown here. Please furnish chemical names. Also see Chemical Compatibility information for Morse 55-gallon barrel pumps. Chemicals may be hazardous. It is the user's responsibility to take appropriate safety and protective measures. 55 gal drum hand pump specifications are subject to change without notice. 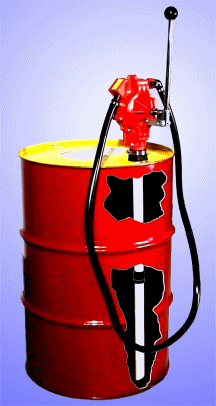 Hand Drum Pumps to Dispense 55-gallon Drums. Morse 55 gal drum hand pumps.